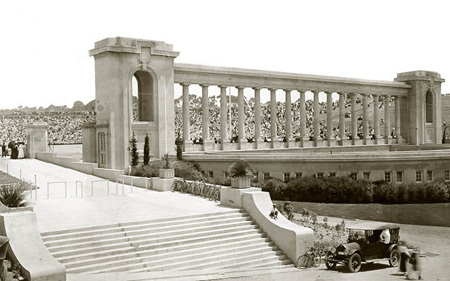 Built in 1914, Balboa Stadium was located behind San Diego High School and was the Chargers home from 1961-66. 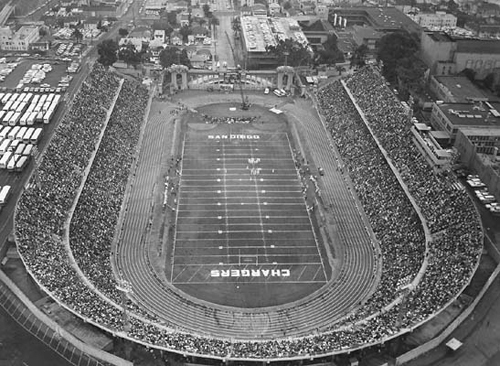 A high school field with concrete slab seats, Balboa Stadium witnessed the Chargers glory years and hosted the 1961, 1963, and 1965 American Football League championship games, as well as the 1961, 1962, and 1963 All-Star contests. In their six seasons here, head coach Sid Gillman's club finished with combined record of 28-12-2, winning four Western Division titles and one league crown. In 1967, the team left Balboa for new San Diego Stadium in Mission Valley, where the club's glory slowed and the titles stopped. BALLPARKS.com © 1996-2017 by Munsey & Suppes.